Back in August of 2006, Lisa and I flew to Reno, NV to visit our friend Vin. From there, the three of us all rented an SUV and set off for a week of adventure throughout Nevada, California, and Oregon. Along the way we saw some incredible sights, visited all kinds of roadside haunts, and ate the heck out of some exceptionally tasty standard fare. It was more fun than we’d all had in a really long time. On our last day, as we were slowly making our way back to Nevada, we made one of the best stops of the week. Way up in northern California, nestled in the shadow of Mount Shasta, you’ll find the little City of Weed. Feeling properly welcomed, we drove on to our ultimate destination: The Hi-Lo Café, Motel and RV Park. Now, Lisa and I are from New Jersey, and Vin is originally from Long Island. It’s pretty much agreed that back home you can’t swing a dead cat without hitting at least a diner or two. Sadly, the same can’t be said for the rest of the nation. That doesn’t mean, however, that you won't find any. It's just that they just don’t usually call themselves diners. But once you’re inside one, sitting at a booth and looking at an all-day breakfast menu, it becomes apparent that no matter where you go, you can always find a place to get a good meal that reminds you of home. 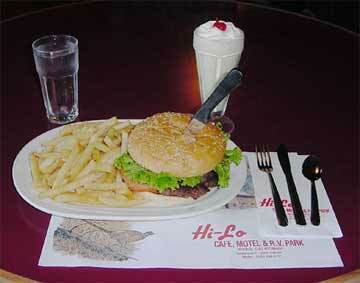 In Siskiyou County, The Hi-Lo Café is that place. Pulling up in front, you can’t help but admire the Googie-inspired sign that dominates the front of the building. Once inside we were shown to a booth that was adorned with cool-looking, custom paper placemats. At this point, things definitely looked promising. Our lovely waitress, Jean, brought us some menus, and I wasn’t disappointed. They were printed on the back of a specialty newspaper filled with cool little local tidbits. Besides all-day breakfast, there is a mean selection of burgers. I homed right in on the house specialty: The Mountain Burger, a 3⁄4 pound burger with grilled onions, tomatoes, lettuce and pickles. Another 50¢ gets you cheese. 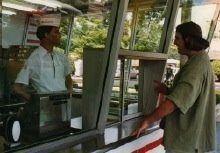 Once we ordered, I went in search of the facilities to wash up. Now, I generally don’t make it a habit to hang out in public washrooms any longer than necessary, but this time I couldn’t help myself. Of course, most men’s rooms don’t afford the kind of view this one did. Looking out of the open window, I was presented with a downright breathtaking view of Mt. Shasta. Once I was able to tear myself away from the mountain, I rejoined the rest of my party to await the arrival of our food. We were to be rewarded for our patience. After a week on the road, the Hi-Lo proved to be the best roadside lunch-stop of the entire journey. Partnered with a mess of seriously good fries, my Mountain Burger was absolutely picture perfect. I’m not kidding. Most places usually present images of beautifully crafted burgers when in reality you often get served some sloppy, misshapen mess. This burger was at least the equal of the one in the marketing photo. How often does that happen? The Mountain Burger is aptly named. It was a challenge to pick it all up in one piece and take a bite that encompassed both top and bottom buns, but with great effort and concentration I was able to manage. After the first bite, my poor, defenseless Mountain Burger didn’t stand a chance. It was cooked to perfection and tasted even better than I had hoped. The fries did their best to distract me from my primary goal, but it was ultimately a futile attempt. One by one they were mercilessly dowsed with ketchup and eradicated with extreme prejudice. This was a two-napkin job, for sure. Oh, well. Getting messy would just mean I'd have to go back to the washroom and stare at the mountain some more. Normally, pie is a must after a good diner meal, but after this one I just couldn’t do it. Satisfied, yet a little sad that we were done, we requested the check and prepared to leave. My only real regret was that I wouldn’t be in town long enough to have another meal at the Hi-Lo. Leaving the Hi-Lo, we took time to drive through the arch that marks the entrance to the City of Weed business district. One last stop in Weed was Ray’s Food Place, the local supermarket. We were out of film and Lisa wasn’t leaving until she got some pictures of the large totem pole that sprouted from the center of Ray’s parking lot. Who put it there and why is a mystery to me, but I’m sure glad they did. It cut a stark profile against Mt. Shasta looming in the background. The scene properly recorded, we were on our way back to Reno by way of the Volcanic Legacy Scenic Byway. On our way out of the City of Weed we were given a final send off by the opposite side of the welcome sign we had seen on the way in. If you want to visit Weed, here's a handy dandy mileage chart from locations throughout California. Before you go, feel free to fill out a Hi-Lo Café comment card.